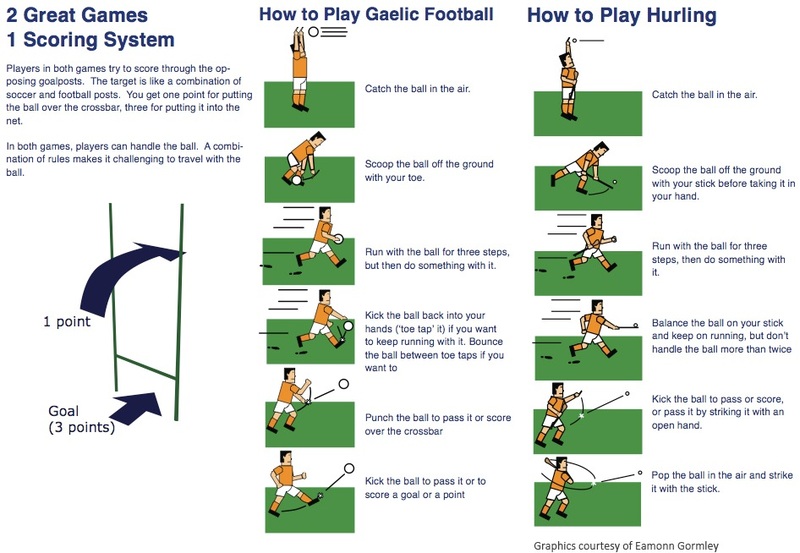 Here you will find lots of info on "How to Play Gaelic Football & Hurling." For more information on the game, you can also download "Skills" cards and Players Documents here. Gaelic football and hurling/camogie are the hottest and fastest growing sports in the United States, and are being played at schools like Notre Dame, Stanford & Saint Joseph’s Universities, and at high schools and elementary schools across the county! Have you ever wanted to touch the ball in Soccer or get a score for sending it over the net? Both sports combine the skills of soccer, basketball, hockey and volleyball, and no, it’s not Rugby. Boys and girls will have fun, fun, fun learning these sports, and a bit of blarney along the way. Football and Hurling are two of the fastest games in the World and are replacing PlayStations and X-Boxes everywhere. - Girls may pick up the ball without using their foot.